Adult Online Discount Ticket (Age 13+) - Save $4 off Gate Price. Ticket valid any Saturday, Sunday or Memorial Day Monday, April 13 - June 2, 2019. Child Online Discount Ticket (Ages 6-12) - Save $2 off Gate Price. Ticket valid any Saturday, Sunday or Memorial Day Monday, April 14 - June 3, 2018. The Royal Experience For 2 includes 2 Adult Admissions, 2 Food Entrees, 2 Soft Drinks, 2 Coupons for a Game or Ride, 2 Admissions to Ghosts of the Abyss Haunted Attraction and 2 Coupons, each for $10 off an Adult Costume Rental. Valid any Festival Day April 13 - June 2, 2019. Retail Value $110. Group Rate Adult Ticket (Age 13+) - Save $6 off Gate Price. Purchase a minimum of 15 Adult and/or Child Group Tickets to receive the Group discount price. Tickets valid any Saturday, Sunday or Memorial Day Monday, April 14 - June 3, 2018. Group Rate Child Ticket - Save $3 off Gate Price. (Ages 6-12) Purchase a minimum of 15 Child and/or Adult Group Tickets to receive the Group discount price. Tickets valid any Saturday, Sunday or Memorial Day Monday, April 14 - June 3, 2018. Includes one beer at each of our three pubs, a souvenir tankard, and a ton of fun! It's More Fun Than You Can Shake A Turkey Legge At! 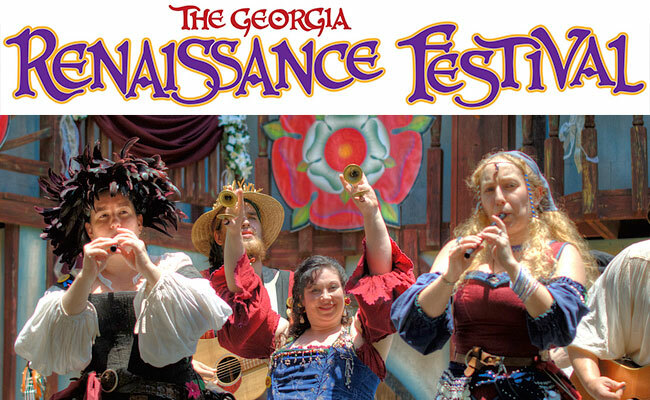 The Georgia Renaissance Festival comes to life every Saturday, Sunday and Memorial Day, April 13 through June 2, 2019, rain or shine from 10:30am to 6:00pm.